Great Palomino Farms Home Just Listed! 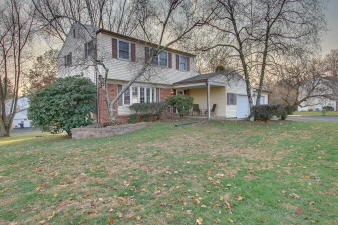 Beautiful Colonial located on the corner of a quiet cul-de-sac. Covered front porch. New front and screen door. Formal entry with glistening pre-finished oak hardwood floor flows into eat-in kitchen. Entry opens to formal living and dining room. Gorgeous refinished hardwood floors. Huge eat-in kitchen, double stainless steel sink. Corian countertops, tile back splash. Corian countertop on island with seating for four. Four-burner gas range with convection self-cleaning oven. Wood mode solid oak cabinetry. Beautiful Anderson windows on 1st floor. Kitchen opens to step-down family room with Berber carpeting. Traditional brick masonry fireplace. Convenient First floor laundry room. Fabulous Sunroom could easily serve as a 1st floor fourth bedroom! Features new over sized sliding glass doors to deck and newer electric retractable awning. Powder room right off of Sunroom. 2nd level features oak hardwood floor staircase to h/w landing. CertainTeed vinyl replacement windows front bedrooms with Anderson windows completing the remaining 2nd floor. Nice size bedrooms w/access door to attic through 2nd bedroom. Partially finished walk-out basement. New roof installed 2018, high efficiency gas heat with electric heat pump backup, C/A. Two plus car garage with insulated garage doors. Large yard with shed. Walk-out basement is partially finished with the unfinished portion having door to backyard. Meticulously maintained!